This has been a really strange week at my house. Both Einstein and I have been feeling really off-kilter, not as a unit, but just thwarted by some recent developments and the emotional energy that surrounds them. Yesterday those emotions came to a head, and we simply couldn't function. So we packed up our kids and our life jackets and went to the lake. Whenever we venture out like this it feels great. We took many mental health days after my dad died two years ago. We drove down to Galveston Island State Park and miraculously had the entire place to ourselves. We walked along the beach in complete solitude, let the girls play in the sand and the sea, and let the the salt air and the grand forces of nature wash over us, and hold us rooted to the earth. We went on day hikes along rivers, discovered waterfalls and massive oak trees that had stood witness to more hopes and sorrows than Einstein and I will ever know. We took long drives out in the country, camped, walked, listened to the wind rush through the trees, and the sound of water bubbling over rocks. And we made our best investment yet: a canoe. 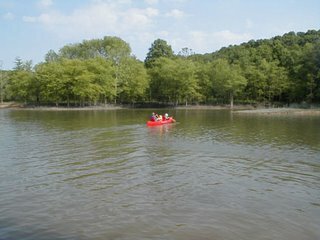 We lived in Austin, Texas at the time and dragged our canoe out on the Colorado River that winds its way through the area, where we explored every little crevice of water around Town Lake. We stumbled upon deer and large snapping turtles, nests teeming with duck eggs, swan couples swimming along with their fuzzy-headed cygnets, and a multitude of dragonflies, blue and sparkling as they darted all around us. We found surprise rain showers and warm, clear springs to wade around in. And more than once we rowed out under Congress Street bridge to behold hundreds of thousands of bats take flight at dusk over our heads. Being in the presence of nature is cathartic. No matter what tragedy befalls us, nature goes on, unhalted. The open air makes room for the energy that swells inside us, causing our hearts to break and our heads to spin-- nature gives us all the room we need for that stuff to dissipate. It helps us slow our heart rates, think more clearly and gives us room to breathe. Yesterday we ended up at a nearby lake. We made friends with local fisherman, and the kids were a captive audience to three families of geese and their combined 18 goslings. We watched birds and noticed the myriad shades of green in the trees across the lake. We rowed and sat. Contemplated and breathed deeply. And held each other. We're always teaching our kids something. Hopefully mental health falls somewhere at the top of the list. I hope when they're older they will remember these days on the lake and be able to release their own inevitable sorrows into the wind, and like the geese, find their way home again. "So give your children your greatest gift: strive to become the person you always wanted to be." But what about me? My dear friend Moxy Jane asked me if I had done the same for myself. Goodness knows there are things I'd like to accomplish yet in this lifetime, various and sundry things that I forget or continuously push to the back of my plate, things that are mundane, or pipe dreams, or just plain overwhelming. I'm human, I can only do so much in a day... but why not? Ok, I said, I'll do it... I'll write my own list. But I didn't, I pushed that list to the back of my plate and forgot about it. Good friends don't let you get away with that sort of thing. She pestered me about it again and again, until finally I'm doing it. She turned me onto this website where everyone is doing it. It's called 43 things, a place for anyone and everyone to share their goals and chart their progress. It's not really a novel concept, is it? Anyone can make a list, but to make that list on a worldwide forum and share the energy and power of a group of people who are aspiring to their own dreams right along with you? That's huge! Small ideas like this can change the world, one act of random kindness at a time. One clean toilet at a time. It doesn't matter, it's all about striving and evolving and empowering ourselves and becoming. Making the impossible seem a little more possible. 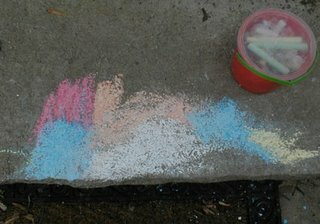 We use chalk for everything-- making pictures for our elaborate stories, studying forms, writing lessons, playing games... and I love the Zen quality of it. Its impermanence allows us to change and grow and discover new things all the time. We're never stuck in the same rut. The impermanence forces us onward, so that we're constantly creating new worlds. "How far can Mom jump? Hee, hee." The blue on the bottom left is Arizona, next comes the white blob, which is Texas. The yellow on the far right is South Carolina. Everything else is the midwest. We live in the red state, apparently, which isn't anywhere close to Arizona in real life... but a girl can dream. She has pretty much covered everywhere she has been in the recent past, and I find it amazing to see how she's putting these pieces together in her mind and making sense of the world she knows. Wow. As you know, we've been doing a lot of counting over at our house. 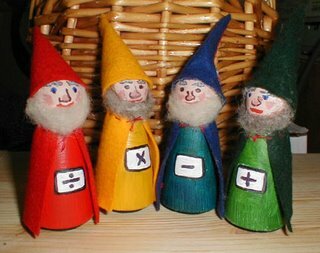 I recently introduced the four mathematical processes, er math gnomes, ala Waldorf education-- just to give Sunburst a taste, an idea, a bigger picture of the beauty of counting. And it was a heap of fun. But, having read a bit of John Holt and other folks, I didn't want to miss this grand opportunity to present a different and important view of the Big Picture of numberland: The Number Line. They're the same idea, really: See where the numbers are? They go up, and they go down. Infinitely. And the four processes? They just represent different ways of moving about on that line. The kids foraged around and found their sidewalk chalk had survived the recent week of rain, and we set to work. 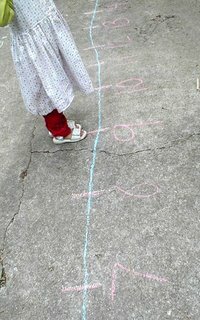 I didn't have any grand plan, so I just numbered as far as I could on the back patio, spacing the numbers out by about a foot each. I wanted Sunburst to really see them as separate pieces within the whole. I even threw some negative numbers in because this was the Big Picture, the whole picture, and numbers indeed go both ways. She knows this when Einstein borrows money for coffee and writes her little I.O.U.'s. Negative is what dad owes , or is it what you no longer have since dad has borrowed it? Real life applications. 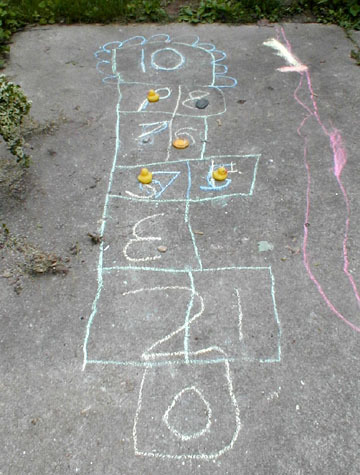 Thus, the groundwork was established, and the games began. We grabbed out our green and blue silks and set to work, taking turns being gnomes: Tally (addition) and Minus (subtraction.) Minus dropped things and gave things away and always kept going backwards. When he promised more than he had, he went negative. Tally just kept adding and adding and adding, well beyond the numbers I had constructed. "20" was off the patio and in the middle of a bush, and it was a crack up everytime Sunburst realized she had to go in the bush. On the second day Sunburst couldn't wait to play again, so we grabbed our yellow silk, and pretended to be Myriad (multiplication.) We counted by twos, hopping. We counted by threes, fours, and fives. Understand, my number line only went to 18, so we were a bit limited, except that Sunburst really wanted to go back into the bush for 20. So we counted by tens... and she kept going--- through the bush, to the big tree, all the way around the yard, calling out the numbers by 10's... She finally leaped over the bean patch and yelled 100. When Einstein came home she wanted to repeat the whole experience for him, number by number. When she told him she could count by fives, he challenged her. And she did it! We had only gone to 15 outside on our number line, but with that little bit she figured out the pattern and counted up to 95 by fives. Mother baked a chocolate cake. How many eggs did it take? Do you ever find yourself most of the way through a good children's book where everything is goodness and light and age appropriate, and then WHAMMO!-- things start to hit the fan? Last night we finished reading Little House in the Highlands. Great book. Gentle and interesting and good character development. History, haggis, the whole nine yards... it takes place near Loch Caraid aka "Friendly Lake" in the Highlands of Scotland. The main character is six years old and behaves like a six-year-old. Such good stuff, that both my girls were engaged and happy and brimming with excitement about it, connected to it, feeling it in their hearts and souls and then BANG. Something devastating happens in the penultimate chapter that throws us into a quagmire of grief. Sunburst, in particular, sobbed with wild abandon. Understand that she's seven, and seven-year-olds can be wired like emotional rollercoasters, but still. I don't think it was entirely unwarranted. Martha's doll, Lady Flora, drowns in the loch. Her best brother floats her out there on a makeshift boat, unbeknowst to Martha, and she arrives in time to see her doll slowly sink under. It's not just a doll, but her constant companion. To make it worse, the doll is wearing new, fancy clothes to match Martha's new fancy clothes. The doll is even wearing a woolen shawl that Martha had spun and knit herself... and it's this woolen shawl that really does her in--the weight of it when it gets wet drags her down into the depths of the loch never to be seen again. Ok, so it's a doll, not a person. But to a child? This is big-time. Sunburst has two dolls that she loves more than anything. One, a Waldorf doll I made for her years ago, and two, a doll my sister made for her just this Easter. She cannot and will not sleep without them. She gets them ready for bed each night, and wakes them up in the morning. Life without these dolls would be unthinkable. So this plot twist in the otherwise gentle story set Sunburst to wailing like a siren. We had to then finish the story at once.... and hope, against hope, that her doll was saved. It wasn't. After a long and painful last chapter, there is some attempt at resolution in the very last two pages, but for Sunburst it was totally sub-par. Martha gets a new special toy (I won't give it all away,) and the "cold, empty place" in her heart gets filled a bit more. But Sunburst didn't buy into this at all. No. Nothing short of dragging the lake would have brought the sun back into Sunburst's heart again. I fully expect she will go to Scotland someday and attempt to do just that: The resurrection of Lady Flora. "The test of intelligence is not how much we know how to do, but how we behave when we don't know what to do. Similarly, any situation, any activity, that puts before us real problems, that we have to solve for ourselves, problems for which there are no answers in any book, sharpens our intelligence. The arts, like the crafts and the skilled trades, are full of such problems, which is why our skilled artists, artisans, and craftsmen are very likely to be sharp-witted people. Their minds are active and inventive; they have to be." Sunburst has spent the last three days with a drop spindle glued to her hand. We bought a spinning wheel last month, and she has been driving herself, and the rest of us, near crazy trying to make it work for her. 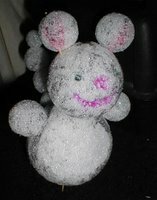 We generally encourage all artistic endeavors in this house: drawing, sewing, painting, music, pottery, knitting, whatever. Einstein and I can't seem to stick to just a few interests. We have to try everything, at least once. 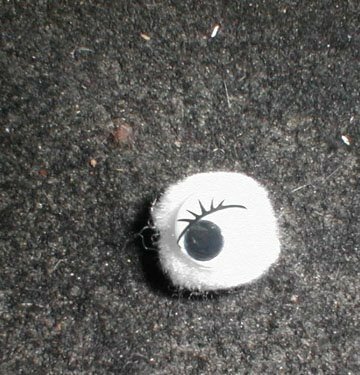 And that's an example that seems to have stuck, at least with Sunburst, even though her attempts with the spining wheel always end in a flurry of tangled wool and exasperation. Conincidentally, we just reached a point in our reading of Little House in the Highlands where the main character, Martha, tries to spin flax on her mother's spinning wheel. And it's hard! And she's just not tall enough yet to make it all work. 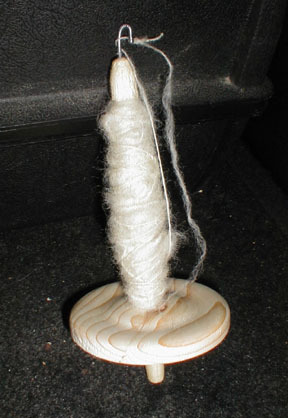 So instead, Martha ends up learning to spin wool on a drop spindle. "Don't we have one of those?" asks Sunburst. 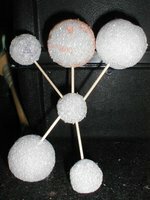 Einstein had made some out of old computer cds and a dowel over a year ago, and they worked great... until they got sat on. So Sunburst showed him the picture in her book, and low and behold he emerged an hour later with a wooden spindle. It has been stuck in her hand ever since. She's working on her second ball, apparently confident enough in three days time that I caught her giving an adult neighbor spinning lessons out in the yard. When the neighbor asked her what she was going to do with all that yarn, Sunburst announced that she has big plans. "Well, I'm thinking I'm either going to knit a doll blanket or mittens. Maybe I'll knit mittens and then dye them if we can find the right kind of dye." This was news to me. Of course, Martha is also knitting mittens with her homespun yarn, so it makes sense. But when Sunburst got out of bed tonight and announced that she couldn't sleep because she was having a knitting idea about making a huge dishcloth with a hole in it, and it was an idea that couldn't wait for morning... well, I have to wonder. Where and how does she come up with this stuff? Does art really make you smart? 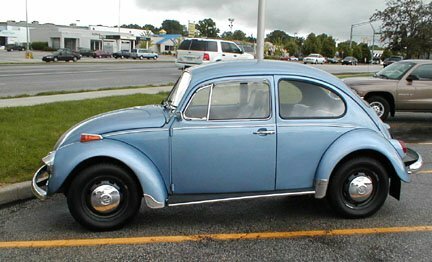 While out driving yesterday, I spotted something that stopped me dead in my tracks: a 1969 Volkswagon Beetle. For Sale! I almost never see these beauties for sale anymore, at least not while I'm on my way to buy groceries. I had to stop. I had to get out of my car. I had to peek in the windows and peer inside the engine and lay down on the wet asphalt and gaze longingly at its underbelly. Not many people would understand this obsession of mine, but those of you that know the deepest parts of me, know. You know that my heart started aching the minute I set eyes on it and I could hardly sleep thinking about it, trying to rationalize the purchase in my brain. In the midst of the grand procession of Mother's Day joy, the seller returned my call. He was asking $4,500 for it. A fair price for a car that's almost 40 years old. It had a new engine, new interior, new gas tank and lines, new tires, and all those lovely chrome bits-- ALL of them! Nothing was missing. Everything worked, even the windshield wipers-- which is no small feat. But $4500?!! That's a whopping sum for a one-income family like ours. And it's not even a family car, or even safe. My last VW bug got busted to bits when I was rear-ended twelve years ago. A newly rebuilt engine, gone in a flash, and me, whisked to the ER with sirens and the whole nine yards. No, definitely not a safe ride for kids, even if I could fit them and their carseats in it, which I can't. It would have to be a grown-up toy. My toy. I could drive it to the store, I guess, if I ever went to the store alone, which I don't. Impossible! But my brain tried to rationalize it all day long. We could take the money out of stocks. I could host a bake sale. It could be my Mother's Day present! I could drive it to knitting class and relive my youth for ten minutes a week! Sigh. There must be some way to make it sound feasible.... I tried all day. Meanwhile, while I mulled over the VW, Sunburst gave me this Mother's Day present, a styrofoam ball sculpture of our old, beloved cat, Peppercorn. She ran away 16 months ago. This is one of the many tributes to Peppercorn that we have acquired over the last 16 months. It's the first planter though, as this is intended to be... something to decorate plants with. A large styrofoam mass of cat-gone-by. Very sweet. It may, however, need its own pot. This cat will remain in our hearts and minds and now plants forever. 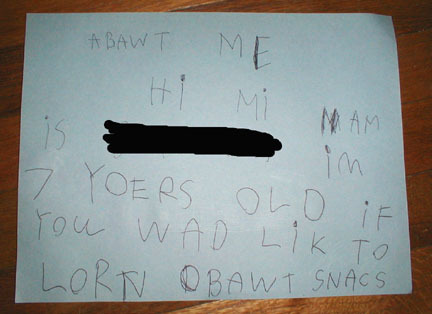 Sweet, clever children. All this is mine, all mine! What was I doing pining away for a 1969 Volkswagon Beetle? And on Mother's Day of all days, when I already have a pile of lovely presents, I'm trying to convince myself that the universe must have dropped this car in my lap for a reason. The perfect day, the perfect car --just like the one that I lost 12 years ago, only better. Perfect. Near Mint Condition. A reward for all my hard work and dedication and perserverance and long labors and cheeriness. I went ahead and took it for a test drive. It was dreamy in that nostalgic kind of way, but it wasn't perfect. It was actually a bit rough and finnicky and awkward. It was easier to handle than our '65 VW bus we recently sold, but still, not the pleasure ride I had been working it up in my mind to be for the last decade. It was actually a lot like work, and goodness knows that with three kids and homeschooling I don't have time for any more work. And then I realized that that was the part I loved about it. The work. The fiddling, the fixing, the getting greasy and figuring out bits of it, like the time the starter went out and I had to continuously push start it for three months. Or the time my bearings busted loose, killed the speedometer cable, and made the most horrible racket known to man. Or the time my wipers went out in a heavy downpour and I had to blindly pull over and wait out the storm for over an hour. And the time the engine went completely kaput and I asked the mechanic in all seriousness, "How hard is it to rebuild an engine?" That car and I had memories. It grew me up into the person I am today. If I hadn't ever greased a set of ball bearings, or fiddled with a cable, or gave it a multitude of solo running pushes before jumping in.... If I hadn't ever really listened to the melody of the rain drumming on a tin can roof, or steam-cleaned an engine, rebuilt a carburetor, replaced spark plugs, or loosened a stubborn bolt with a torch... I'd be a VERY different person today. It made me capable of pretty much near anything. Fearless. Strong. Independent. "I don't think I'll buy this car today," I told my daughters. "But someday, when you're older, we'll get one. It may not be a '69, who knows. Maybe it will be a '63 with an oval window... but anyway, we'll get one. And it won't be perfect. It can be our homeschool project. We'll have to fix it up, you see. We'll get some parts, and some tools, and we'll take the engine out and get all greasy, and make it run good as new." Moonshine, my princess duck, looked at me with all sincerity and asked, "Tomorrow?" Last night I found myself telling an old friend about a recent work dream I had. She and I used to work at a movie theater when we were in college, back in the day. We shared the same shame of donning those awful, itchy polyester suits with stripes up the sides and matching bowties while we served popcorn and nachos to the masses. We were a stunning sight-- dripping with the stench of greasy popcorn and imitation butter flavor. We spent hours sweeping up stray Milk Duds and popcorn kernels, empty boxes of Junior Mints and Sweet Tarts, filling soda after soda after soda, and scrubbing the popcorn kettle until our fingers ached and we gagged on cleaning fumes. Those were the good times. The bad times, aside from drunks, vomit, bathrooms, and one particularly degrading manager, were relegated to a few choice shows in the summertime, known to the insiders as "kiddie mats." One day a week in the summer we would open for an early matinee showing of old kid's shows-- animated films like American Tail and Teenage Mutant Ninja Turtles, and we'd reduce our admission to a buck. On top of that, we'd bring out these tiny soda and popcorn containers and charge the kids a buck a piece for the pair, soda AND popcorn. It was a win, win situation for the customers... but for us, the lowly servers, it was a nightmare! First of all, we had to be at work at 8 am... which is not horrible unless we were one of the unlucky souls to have worked until midnight the night before, which was usually the case. We had to clock in, hurry up and throw last night's popcorn into a warming bin, dump the icy cold nacho cheese into the machines, and then start filling and capping a ton of those teeny tiny sodas and prepping box after box of popcorn. At 8 am! We'd open the doors and it would be a mad rush. Inevitably, most of the crowd would consist of daycare kids... not just a group or two, but dozens upon dozens of excited, screaming, little folks who completely outnumbered their hired caregivers at least 15 to 1. And they all wanted popcorn and soda, of course. And at least half of them spilled a good portion of each on the floors. Talk about mess! And the caregivers always wanted nachos, which were never, ever quite hot enough at that hour of the morning. And then we'd get chewed out, because a woman with 15 screaming kids needs to feel heard by someone, anyone. "Yes lady, you and your need for hot cheese in the morning are important." Inevitably, at least one kid would get his fat little forearm stuck in a cupholder and be hollering like mad while we greased him like a pig to get it out. More than one kid would pee in the seats or on the floor. Good times, indeed. 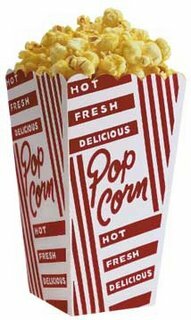 After kiddie mats we'd have bits of popcorn crushed into the carpet all over the lobby and have to clean the theaters with blowers and tackle the soda spills with mops. 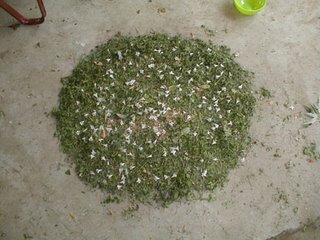 Kiddie mats were like tornados, come to think of it: Loud, frantic, and messy. And they haunt me still today, apparently. I dreamed my superviser was calling me to let me know I was scheduled to be there at 7 am. From Texas, no less. Nevermind that I don't even live in Texas anymore, my dreamself doesn't remember about that. My dreamself was just horrified at the idea of kiddie mats. My dreamself wanted to sleep in, have a quiet morning to myself, maybe have a read over a leisurely cup of gourmet coffee and NOT under ANY circumstances, grease, wipe, mop, blow, sweep, or serve ANYBODY. My dreamself apparently doesn't remember that I'm a mom now, either. It has been 15 years since I worked at that theater. Why would I dream about kiddie mats NOW? After all these years? Then it dawned on me, my life is like kiddie mats. No sleep, get up early, make food, screaming kids ---noise, noise and more noise, and always something underfoot. Everytime I clean one mess up, there is some new disaster, like we're living in a minefield. Kiddie mats. My life has been downgraded to kiddie mats. Hmph. Well, at least we don't have any cupholders. Sunburst is making another book. This one is called, "The Magic School Bus with Snakes." She has been making books for about two years now, off and on, on a wide variety of subjects: storytime at the library, gymnastics class, birthday parties, Halloween... She goes through these heavy phases of book-making every few months, and yesterday she began again. She got out a pile of xerox paper, construction paper, and an assortment of colored pencils and spread them out all over Einstein's desk and set to work. I found her a few minutes later sitting on the couch scanning the indices in several science and nature books. "Mom, it says that a ruhtuculah puhthen is the longest..." Huh? "Reticulated python?" Yeah, that. Big ol' snake. Ginormous. Grows up to 33 feet long, she tells me, something like six bicycles end to end. Whoa that's impressive, I say. 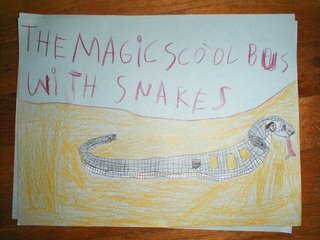 Then she shows me her cover page with the snake bus. Apparently Joanna Cole and her illustrators haven't done this version yet. Cool idea, a snake bus. And she goes on to tell me all the interesting facts about snakes, and how if they were longer than 50 feet they would be too heavy to move themselves. Really. 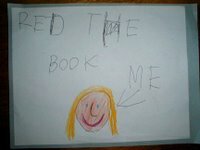 This would be her first attempt at researching information for a book. So far, so good. 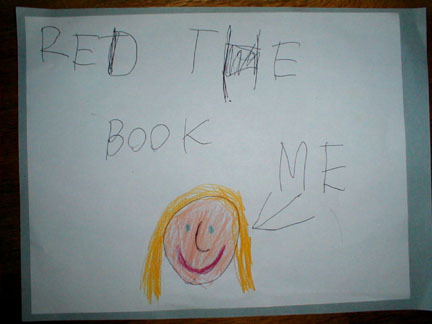 She's already got the two most important pages finished: the cover page and the author notes. "If you would like to learn about snakes, read the book." My favorite subject is... Waldorf? Sunburst and I met with our new family doctor yesterday, and the inevitable question came up. "Are you in school?" "Well, not exactly school..." Sunburst explained. "We do homeschool. You know, we stay home and mom teaches us stuff." --Which to outside ears sounds much better than what she used to say, "No, I don't go to school. We stay home and my mom lets us do whatever we want." In reality, they DO get to do a lot of what they want. We're fully ensconced in the powers of child-led learning, and for the last several months what Sunburst has wanted is something akin to a home version of "school, student, and teacher." So that's what we've been doing, and she loves it. But then came a doozy of a question, "What's your favorite subject?" Sit at your desk, raise your hand, only speak when you're called upon, and no passing notes to the baby. Open your math book to page 32 and do problems 1-16. Use your freshly sharpened #2 pencil and be sure to show your work for full credit. --Which when you're little, is not only a grade but accompanied by a smiley (or not so smiley) face or a sticker, right? Our homeschooling is like a smorgasbord where they don't have those compartmentalized food trays. A little of this, a little of that. It's all out there for the taking, and we heap our plates as we see fit. Sometimes we go back for seconds, sometimes we push things to the side that maybe don't suit our palates, and sometimes we overindulge and need to push our proverbial chairs back and take a break. Subject? I decided to help Sunburst out on this one. "Do we do anything fun?" Her eyes brightened, and she turned back to the doctor. "Oh yes. Mommy tells these stories and we make pictures. I'm learning to draw with block crayons made of beeswax, only I don't outline, I have to start from the middle and shape things out." What subject is that, exactly? That is the Waldorf approach to all subjects, whether it's mathematics, English, science or whatnot, you learn them through storytelling and art. Yesterday we talked about the Big Zero. Minus, our resident math gnome, counted the cups of water that spilled from his bucket onto the sides of the path. It wasn't long before his bucket was empty and we were left with a sum of zero. 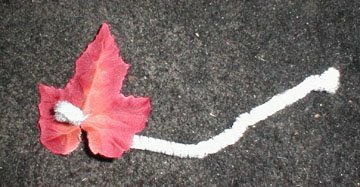 It was a story about subtracting, but also one of giving, for you see Minus had sprinkled some flower seeds along the sides of the path and had chosen to give them life. We do that every day, don't we? We subtract. We give so that new things may come to life. When we hit the Big Zero, the possibilities are limitless. Today was all about subtraction. Kitty Bill was cutting teeth, and so I gave. The phone kept ringing, so I gave. Sunburst inadvertently ripped the dishwasher out of the wall, and I gave. I subtracted the available minutes of my time and managed to only present the next form in our story of Robin Red: a spiral. In the story, Robin goes to the forest in search of Mother Earth and meets the messenger snail, ergo our spiral form emerged. The girls then wisely subtracted themselves from the house and played outside for a good chunk of time. I went out to check on them at one point and found that Sunburst had been practicing making chalk spirals on the patio. Ten feet from that was a near perfect circle, sculpted of collected lawn clippings, and carefully decorated with birdseed and flowers. In Waldorf circles (ha) people talk much about letting a lesson sleep. It's precisely this way that new forms are conquered, new skills are mastered, and so forth. Sometimes we find lessons that we have to let steep for days within our subconscious. I know certain lessons I've been steeping for decades, and still haven't mastered inside myself. But I always forget the power of this sleeping/steeping process, and I'm often startled and amazed by the leaps and transformations these kids make, as if aliens have been visiting them in the night and sharing the secrets of the universe. The big zero came back, during a time of zero expectations, as nature art. Making something out of nothing. Zero. 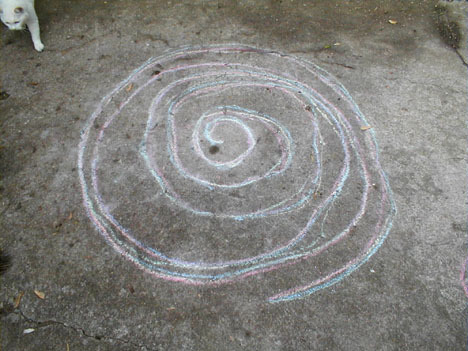 And the spirals? At dinner it occurred to me that it's the same; you start with nothing, a center, a zero, and you go outwards in such a limitless fashion. With zero we talked about meditation, a familiar concept in our house, in which the point is to get back to nothing. To let all the outward forces go and return to the center of spirit, the beating of your own heart. Using the spiral last night, a spontaneous story of Clara came up. Clara, our good story companion, had a time when she was completely overwhelmed, such that she couldn't function. She's a wiseman's daughter and slated to take his place someday, and so of course she took that overwhelmed feeling and just sat with it. She closed her eyes and breathed, and we watched the spiral fold in as her cares washed away and when she reached the center she was still and calm and able to handle anything that came her way. At which point, Sunburst closed her eyes, and began to meditate. Sometimes I wonder who's teaching who here. I think this one was a lesson for me. Never ending or beginning; On an ever-spinning reel..."
"Like the circles that you find; In the windmills of your mind"
Sunburst has been learning to play the pentatonic flute since February. I've been using David Darcy's booklet/cd set Playing the Pentatonic Flute and the Pentatonic Recorder to teach myself so that I can teach her. I can't say enough wonderful things about this booklet. It has changed the way I think about music and my own musical capabilities. For instance, I now think capable as opposed to incapable. I live with Einstein who is a musical genius. He can, and does, play anything he can get his hands on. But he can't teach me... he's my husband after all, and I have this Complex about music. Or shall I say had. I no longer play secretively in the laundry room. David Darcy has brought me into the light. And now I can give that to Sunburst. 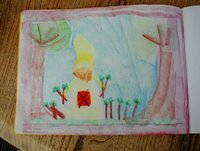 Our second form drawing block was based on a story I made up about the adventures of Robin Red and his search for Spring. 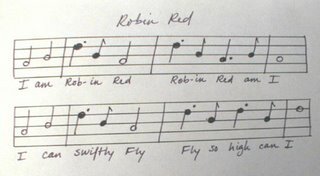 With that in mind, I found myself being challenged to write a song of my own for Sunburst to play on the pentatonic flute: Robin Red. It's simple-- using only the notes A, B, and D. But simple is key, I think. It met her where she was, connected to her heart, and took her playing up a notch. She struggled with it for a couple of weeks, but after her experience meeting a Native American flute player, she returned to this song with renewed vigor and quickly mastered it. 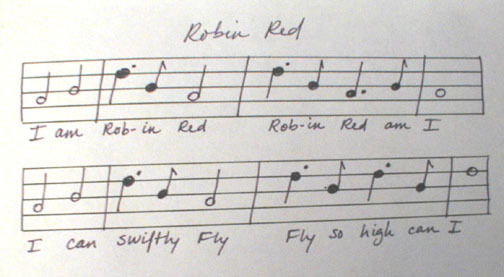 Her own musical confidence grew by leaps and bounds with this song, as if she's now swiftly flying along, too. This past week I introduced math gnomes to help Sunburst understand the four mathemtical processes. Math can be pretty abstract, and using characters and stories to teach it in the early grades is supposed to help kids build a heart relationship with the material or a deeper relationship, or something like that. Regardless of what it's supposed to do, it was a big hit. I looked at Path of Discovery Gr 1, Christopherus First Grade Syllabus, Math for the Elementary Grades, Teaching Mathematics, and Journey to Numeria before presenting the material. Even with all those books in front of me, I still couldn't quite figure out the bigger picture and progression. Right or not, Sunburst is connecting with it, and that's the point. To introduce them, I brought back Clara, one of the characters we've been following throughout our other lessons (Intro to Letters and Quality of Numbers.) Clara was given a magical pear flute by the Sky Queen at the end of our Numbers lesson, so she brought that along with her into this lesson. Sunburst loves to hear that Clara is playing, and sometimes, struggling along with her. My inspiration for this introduction was actually from that news article about the Fairy Rock in Scotland. Clara is the wiseman's daughter, and he sent her to work out a dispute over a new building site that would involve moving a "fairy rock." Only Clara finds out it's not a fairy rock, but the entrance to the gnomes underground cavern. 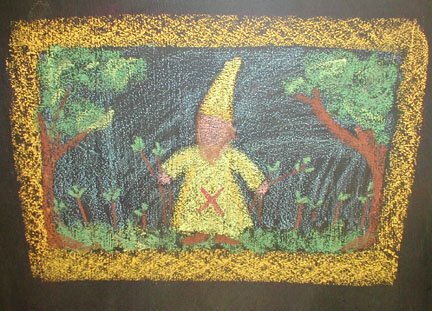 Not only that, the gnomes have four magic trails that run through the area that cannot be built upon. Clara's task was to work things out between the builders and the gnomes, and the gnomes give their input based on their specific personalities, ie. share the houses among the land; more trails/more houses; fewer trails/fewer houses; faster trails/faster houses. Sunburst thought they had interesting ideas, but that Aliquot's idea made more sense. So lesson 1 was to do just that: divide the houses up among the land. Now the gnomes have decided to come up with welcome presents for their new neighbors, and Clara is helping them. Tally collected jewels (Sunburst's idea,) Minus will borrow and morph a wonderful story idea from Wonder Homeschool about a bucket with a hole in it, Myriad is going to collect tree saplings, and Aliquot will help him divide them among the 12 neighbors. 1, 2, 3 ... 12. 12, 11, 10... 1, 0. I'm learning to never underestimate the power of simplicity.